"Entrepreneurship, like education, is about transformation. It the ability to transform yourself and the community around you.". Duane Rollins is a designer, educator, and non-profit leader trying to do a little more good around the nation's capital. Prior to SEED SPOT, he worked as an UX and Instructional Designer at 18F, a digital consultancy within the GSA transforming the way the government builds and buys digital services. 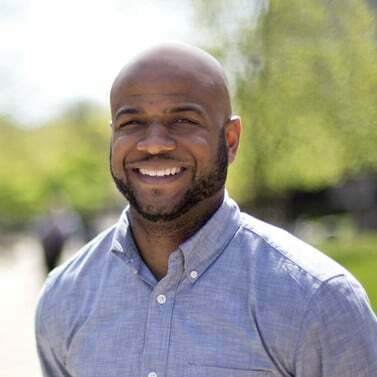 He has also worked at Threespot where he led digital strategy engagements with clients such as the Department of State, Cystic Fibrosis Foundation, the USO, Harvard Business School, and the Rockefeller Foundation among others. Previous experience also includes stints at Juice Analytics and General Electric. He also has a deep passion for education. He teaches at both General Assembly and Georgetown University and helped cofound the Washington Leadership Academy, a public charter high school in DC. In addition he co-founded STEMLY, a non-profit that advocates for high quality STEM education for underrepresented groups. Duane has a masters degree in industrial design from the Georgia Institute of Technology and a mechanical engineering degree from Virginia Tech. He is based in Washington D.C.